The Republic of Austria is a landlocked country in Central Europe. Comprising nine federal states and is one of six European countries that have declared permanent neutrality and one of the few countries that includes the concept of everlasting neutrality in its constitution. The name “Ostarrichi” is first documented in an official document from 996, since then this word has developed into Österreich. Officially the Republic of Austria, the majority of the population speaks German, which is also the country’s official language. Austria is one of the richest countries in the world, with a high standard of living. 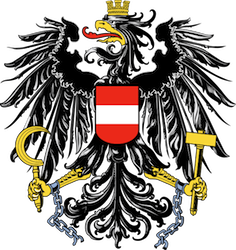 Today’s Austria is what was once the German speaking core and center of power for the large multi-ethnic Austro-Hungarian Empire. However, from the start of the 20th century, the political history of Austria has been closely linked to the misfortunes and disasters of modern German history, mainly the First and Second World Wars. Austria‘s past as a European power and its cultural environment have generated a broad contribution to various forms of art, most notably among them music. Austria has been the birthplace of many famous composers such as Johann Strauss, Sr., and Wolfgang Amadeus Mozart was born in Salzburg, much of Mozart’s career was spent in Vienna. Austria was the cradle of numerous scientists with international reputation. A present-day quantum physicist is Anton Zeilinger, noted as the first scientist to demonstrate quantum teleportation. A focus of Austrian science has always been medicine and psychology, starting in medieval times. Austria was also home to psychologist Sigmund Freud. Austria‘s cuisine is derived from that of the Austro-Hungarian Empire. Famous for its variations of beef and pork and countless variations of vegetables. There is also the “Mehlspeisen” Bakery, which created particular delicacies such as Sachertorte, “Krapfen” which are doughnuts usually filled with apricot marmalade or custard, and “Strudel” such as “Apfelstrudel” filled with apple and “Topfenstrudel” filled with sweetened sour cream. Typical Austrian dishes include Wiener Schnitzel, Schweinsbraten, Kaiserschmarren, Knödel, Sachertorte and Tafelspitz. There are also Kärntner Kasnudeln, a cooked filled dough-bag with a type of cottage cheese and spearmint. The “Eierschwammerl”, also known as “Pfifferling”, are native yellow, tan mushrooms. The candy Pez was invented in Austria.